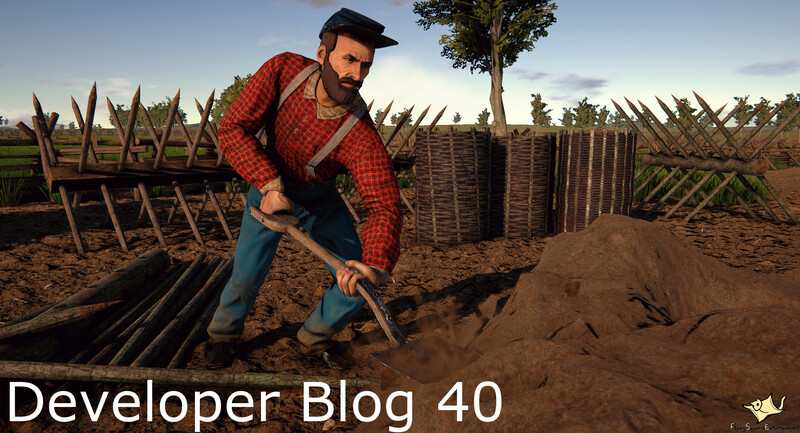 Just like in our previous game, "Napoleonic Wars" we are going to feature an Engineer/Sapper class that has the ability to construct various defensive works including, but not limited to, Chevaux de Frise, Fascines, and Earthworks. Engineers will carry a 2-Handed Axe, a Construction Hammer and a Shovel. 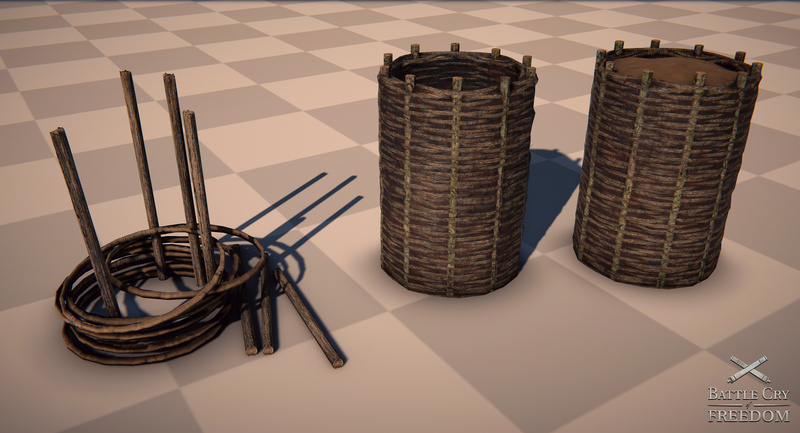 Here are 2 small pictures of some of our constructible defenses. As you can see, we now have a much broader range of constructible defenses available. Each constructible has its own unique settings for bullet penetration/absorption and pass through. 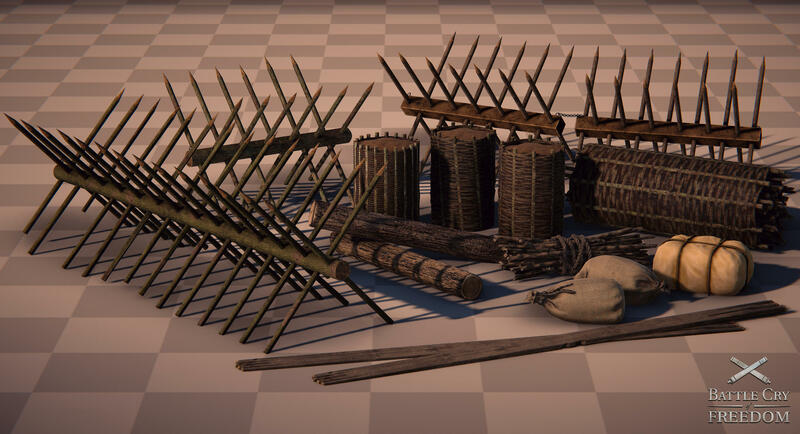 Combined with a wide range of different objects and build-point costs, this should make for some great gameplay, as each defense has its own up- and downsides... Additionally, we have decided to get rid of sandbag walls and instead allow players to place sandbags and other items individually. 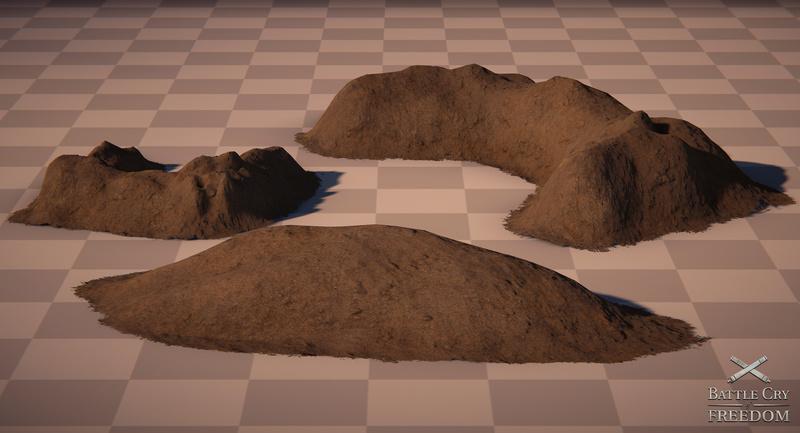 Players can now also dig various different earthworks. This allows for much greater variation and creativity. For example, the defensive structure below has been built using various constructible items. Placing constructibles has been made easier. Players will now see a "ghost" object visually displaying where the constructible would be placed, before deciding to build it. Should the player try to place the object where it is not possible, the ghost will turn red and indicate that it is not possible to build there. We have also added the ability to rotate the object using the scroll-wheel of the mouse. Once the player has decided for a spot, the object can be placed down with the left mouse button, and a non constructed version of the constructible will spawn. Hitting it with the construction hammer will add health to it, and once it reaches a certain threshold, it will change to the next stage. Changing the "melee mode" of the construction hammer will switch it to deconstruction mode. De-constructing with a construction hammer will give back almost all of the original build points. You might have noticed, that the gabion above is switching through several stages. We have programmed a feature that allows us to add as many construction stages to a prop as we want. For example, gabions have 2 construction and one finished stage, but a cheval de frise only has one construction stage and one finished stage. Sandbags, cottonbales and other similar items do not have any construction stages at all and can be build in the finished stage immedietly. 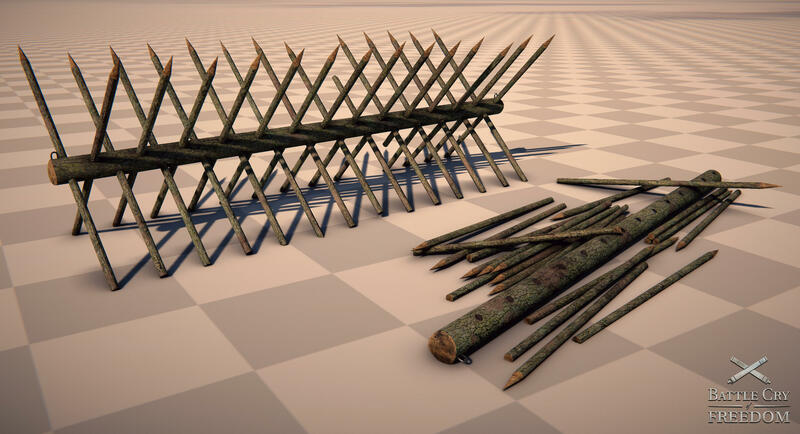 Obviously, just like trees, fences, doors and many other objects in the game, all constructible objects can be destroyed by melee weapons, artillery and firearms. The 2-handed axe that the engineer class gets is especially useful for this purpose. Thats it for this Developer Blog. Thank you for reading this blog. We hope that we can come back to you rather soon. We are currently in the final stages of preparing the game for an early alpha test and as such we are currently very busy. We are prioritizing game development over writing blogs, so please bear with us.